The well-worn phrase: “There’s no ethical consumption under capitalism” suggests that trying to make ethical purchases is a contradiction in terms. However, it shouldn’t be a way to excuse ourselves from joining international acts of solidarity like the Boycott, Divestment and Sanctions (BDS) movement for the liberation of Palestine. Boycott – withdraw support for Israel and any company involved in the violation of Palestinian rights, including complicit sport, cultural and academic institutions. Divest – encourage your bank, churches, universities and others to withdraw investments from all Israeli companies and international companies involved in the violation of Palestinian rights. Sanction – pressure governments to hold Israel accountable, end military trade and free trade agreements, and expel Israel from international forums, like FIFA and the UN. This tactic is inspired by the Anti-Apartheid Movement (AAM) which called for a boycott of South African goods and more between 1959-1994 as a call to end violent white apartheid in South Africa. Over 100 local authorities in the UK took part in some form. Palestine has been occupied by Israeli forces and settlements for decades in nothing less than an act of colonialism, and Palestinians face daily sub-human treatment, brutalisation and often death. It’s an international open-dirty-secret and boycotts are a proven tool we can use to challenge international oppression. The point of BDS is to hit the settler state of Israel where it hurts: its pocket. By boycotting companies investing in the violent occupation of Palestine, we not only affect their profits, but also their reputation. When it comes to what we buy and where we buy it from, it’s important to remember that it’s okay to want nice things. From Eurocentric beauty standards to the structural poverty people of colour (PoC) endure – everything around us is designed to make us feel inadequate, ugly and that in order to be happy we need to work harder to buy better stuff. This is capitalism 101. Choosing how we interact with this system (while simultaneously working to dismantle it) is an effective method which helps keep things like the Palestinian struggle in focus. Or at least in Western consciousness. While I can easily boycott places with a tangled history of Israeli support like M&S – because I can’t afford to shop there anyway – makeup is genuinely one of the hardest things to buy while supporting BDS. This is mostly down to the fact that L’Oreal and Estée Lauder, both explicitly opposed to BDS, own a ridiculous amount of companies, inlcuding MAC and Maybelline, Clinique and Garnier. L’Oreal have worked in Israel since 1990 and their L’Oreal Israel factory operates in Migdal Ha’emek, or rather al-Mujaydil, an occupied Palestinian village. They also use Dead Sea minerals, benefitting from the occupied Palestinian West Bank hosting one third of the Dead Sea shore. In addition, the heir to the Estée Lauder Company’s fortune and current board member, Ronald Lauder happens to be president of the Jewish National Fund (JNF). The JNF is hugely implicated in Palestinian land grabs and evicting Palestinian families from their homes, all while pretending to be a squeaky clean group dedicated to planting trees. When shopping ethically for cosmetics, I also choose products that do not compromise my veganism. I am vegan not only because I don’t believe in harming animals, but because industrial farming contributes heavily to devastating environmental effects – which affects the world’s poorest (read PoC) countries the most. The companies that are massive corporate non-BDS-adhering brands are usually also not cruelty free, let alone vegan. So, for me, participating in BDS is a kind of weird, inverse “two birds one stone” ethical choice. I love makeup, and think that it is an important way to express yourself. It is also the perfect form of self-care for me. 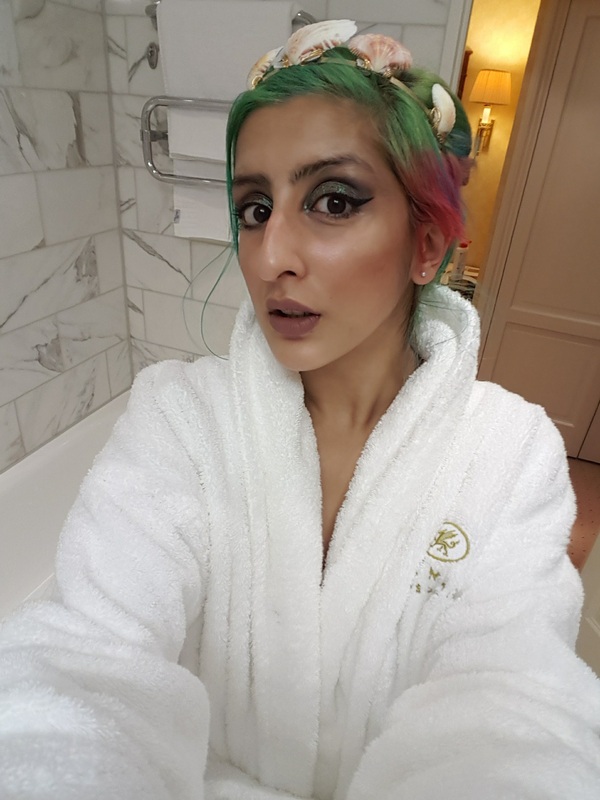 I’ve managed to build a little collection of BDS-adhering (and vegan) makeup to share, but first things first: I refuse to use Instagram and be surrounded by bizarre unrealistic images, and this is my excuse for my shoddy selfie-game. We’re here for the makeup so bear with me, and I dunno, comment with better angle-tips. The Ordinary Hyaluronic Acid – this stuff will make dry skin scarper like Theresa May at a live debate. EX1 Invisiwear foundation, which doesn’t cater for any dark skin tones, so please comment with better options. Phee’s Makeup – blusher/highlighter in Sunset & dual tone eyeshadow in Pollila. The Balm: Schwing liquid eyeliner. Concrete Minerals Zombie Girl eyeshadow in Graveyard. My trick is to find small independent brands – that way they’re usually both cruelty free and follow BDS rules. Try websites like CuteCosmetics.co.uk – which is where I found OCC Cosmetics liquid lipstick before anyone was doing it, as well as industrial level pigment from Sugarpill. While you’re perusing CuteCosmetics.co.uk (send me gift vouchers if you’re seeing this plug CuteCosmetics – I am doing your work!) check out Shiro Cosmetics – they have Miyazaki, Game of Thrones, Fullmetal Alchemist and Pokemon themed makeup. Plus, look at this green pigment. Another way to fritter my wages is with a brand who made Munroe Bergdorf their new face after her disgusting treatment by L’Oreal, and literally wrote a statement of anti-fascist support: Illamasqua! Obviously I wish people were supporting the Anti-Fascist Network more and their commitment to fighting fascism around the UK, but they’re not in the business of selling lipstick this good. When treating yourself to cosmetics it doesn’t need to be fancy online products – in the UK, Superdrug stocks a lot of BDS friendly bits. They have the mega GOSH (Rebel Eyes mascara is life), Sleek, Barry M and their own B. makeup range. Plus, they’ve recently started selling e.l.f. which in my opinion is the budget beauty secret of the century, and you can now buy it on the high street. 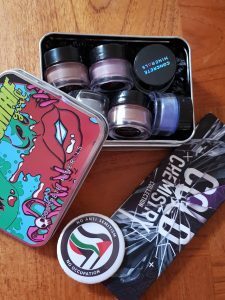 If my goofy pics are anything to go by, supporting BDS and indulging in make up isn’t so hard – and even when it presents challenges, it’s a small sacrifice compared to the reality of Palestinian life under occupation. Acts of solidarity should move even further towards helping to raise awareness and funds. The ongoing suffering of Palestinian people risks being ignored as many long-term struggles are; the public becomes numb to the suffering and bored of the continually unfolding story. But I say keep it alive. 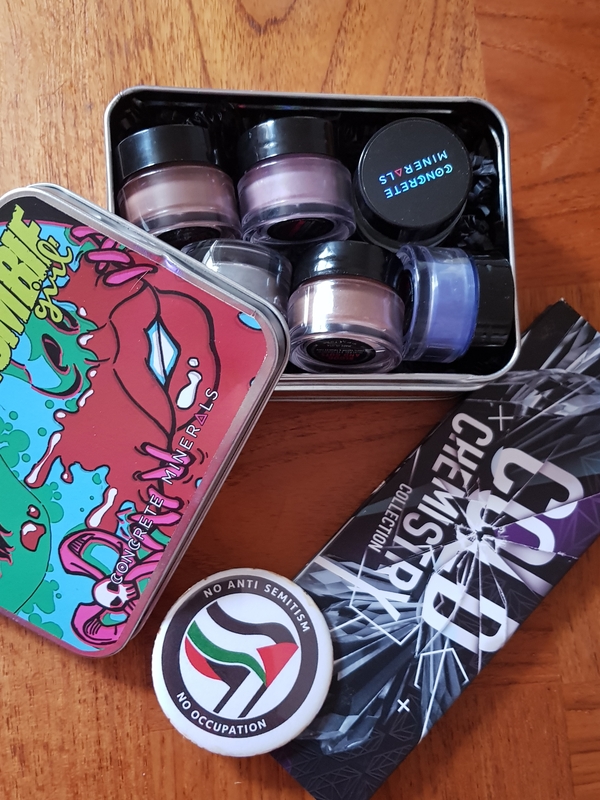 Support BDS, talk about it more and help galvanise solidarity movements across the globe – from your makeup bag to the picket line.